The mystery lock that wouldn’t respond on the radio, watching the Army Corps cranes build rock walls, the magic hour before sunset, escaping a car ferry in the darkness, searching moonlit islands for a sandbar, a leaping fish trying to slap me in the face, a tug’s spotlight turning night into day from two miles away, St. Louis glowing on the horizon. I could tell a lot of stories from today, but they all wash away behind a tattered confederate flag hanging from an old pole along the Missouri bank. I wanted it to be grits or sweet tea. I wanted it to be a southern accent or fried catfish. I wanted it to be live oaks or spanish moss. I wanted it to be anything but the stars and bars. But there it was, pulled tight in the wind, tattered and ripped, but still full with hate and sharp as a gunshot. Posted in Angle to Key WestTagged AKW November, Angle to Key West, confederate flag, mississippi river, missouri, racism, the southBookmark the permalink. Wow. I hope you find a better South further on. 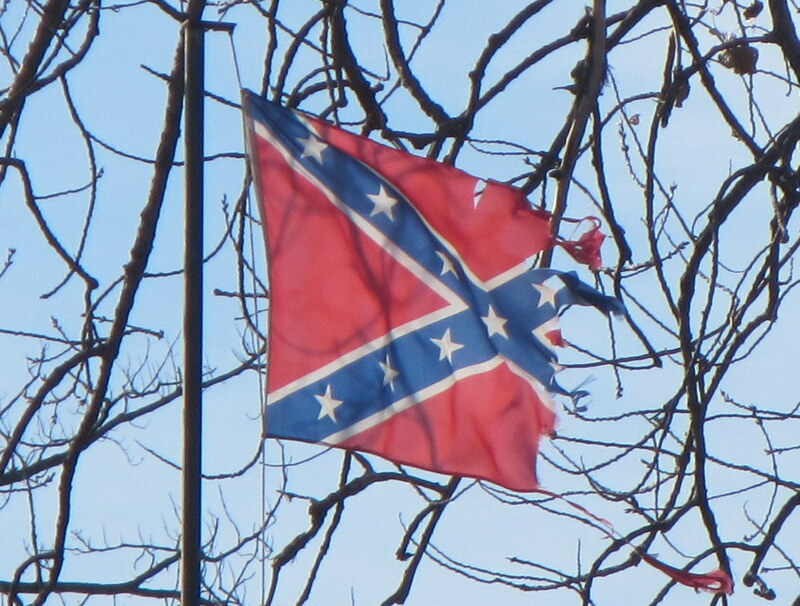 Yes, some people still fly the confederate flag here. However, it is some better. Mostly, it is hidden, but the hate is still present, unfortunately. The last tattered vestiges blowing in the wind. My friend Rebeca told me that she was living in St. Louis in ’03 when disastrous floods made it necessary for volunteers to bank sandbags. She showed up with a group off teen-age boys of African heritage and was told they couldn’t work beside the white people and had to leave. “It’s” still there, tattered and worn, and dying. Some things we clutch onto until death do us part. Come Unity. That’s one flag….there are many other people that don’t hold that hate! That is terrible but not consistent with the St Louis area. Sure there are ignorant people all over but the majority around here are more tolerant than that. Also St Louis is not really “The South”. I also doubt that in a disaster relief effort willing volunteers were turned away. I’m sorry but I live here and this is not an accurate representation of my home, so I had to say something. The Confederate Flag is not a symbol of hate, as it is portrayed. It was a flag representing the South, at one time. Do your history lessons on the Civil War and find the truth.